This body sunscreen from Bioderma is one of our favourites because it’s an extremely easy product which is perfect for everyday use. Leaving behind no residue whatsoever, it disappears into the skin effortlessly, without a white mark in sight! It activates the skin’s natural defences and protects from risks of cellular damage, offering real internal biological protection (also known as Cellular Bioprotection). We have to add that this product is a great choice for very fair, vulnerable skin, especially skin with freckles, as it offers extremely high UVA protection. We love a spray bottle format, and because the fluid is quite runny, it doesn’t clog the nozzle (we’ve seen that happen too often!). It is not scented, which is a nice change, as it doesn’t interfere with your perfume. In fact, it’s almost more like a veil than a regular sunscreen as it performs its job perfectly without you even knowing it’s there. 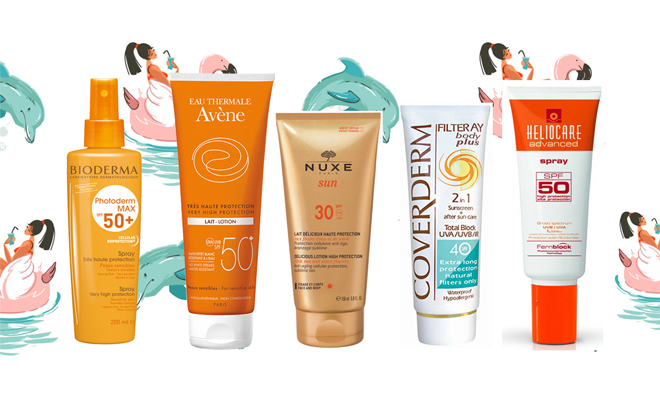 In addition to being highly effective, Eau Thermale Avène sunscreen is also marine-safe, meaning it does not contain chemicals that are harmful to marine life. This is becoming increasingly important as more and more countries take a stand to protect their oceans and its inhabitants. Silicone-free and produced with a minimum number of sun filters, its biodegradable formula contains a powerful antioxidant and photoprotective actives offering broad-spectrum UVA-UVB protection. We love that the product is suitable for even the most sensitive skin, making it a great choice for the whole family. The sunscreen has no strong fragrance which is great as it won’t deter from the fragrance you’re wearing, and rubs in easily without leaving any white marks. Most sunscreens have a gorgeous scent, but this one from Nuxe is really in a class of its own. In fact, it’s not even necessary to wear a fragrance when you’ve lathered up with this as it is so beautifully perfumed that nothing more is necessary. That’s thanks to a mixture of vanilla, Tahitian gardenia and sweet orange. But besides for that, it has a gorgeous non-greasy silky texture that melts into the skin. We found it to be highly effective in protecting the skin from sunburn and it is highly moisturising – skin feels soft and smooth after application, and even after the product has been washed off. Coverderm is known for their vast array of top quality suncare and makeup products, so we were super excited to give this body SPF a go. A physical sunscreen consisting of zinc oxide and titanium dioxide, it also contains aloe vera for its cooling, healing and anti-inflammatory properties and reasun to protect and repair already-existent damage to the skin. All the sun filters are natural, so it’s safe to use on the whole family, including young children. The consistency is thicker than that of a lot of other sun products, reason being that each application lasts around six hours on the skin and is highly resistant to water and sweat. It’s a unique product in that it combines sun protection with after sun, so the skin is calmed and soothed while it’s protected. A firm favourite among doctors, therapists and beauty editors, this sunscreen delivers on its promises. We love the convenient spray packaging as it makes the product really easy to apply and the light, runny consistency absorbs like a dream. It offers long-lasting protection thanks to the unique Fernblock plant extract with proven photoprotective properties. Our editor used it all day on a beach holiday and walked away burn-free, with soft and hydrated skin that didn’t feel like it spent too much time outdoors. And like all Heliocare products, it smells like an island holiday in a bottle. Do you have a favourite body sunscreen? Tell us in the comments section below.